Diabetic eye disease is the number one cause of blindness and vision loss in working-age adults. People with diabetes are at risk of several conditions that, when detected early, can be treated to reduce vision loss. Diabetic retinopathy affects 5.3 million Americans 18 years of age and older. Diabetic retinopathy occurs when the blood vessels in the retina, the light sensitive tissue in the back part of your eye, become damaged and leak resulting in blurred vision and vision loss. Diabetics are also twice as likely to get cataracts and glaucoma than someone without the disease. Cataracts develop and cause your eye lens to become cloudy, interfering with your vision. Glaucoma damages the optic nerve which can also cause vision loss. The longer someone has diabetes means a greater the likelihood that these complications could occur. In early stages of diabetic eye disease, there are sometimes no indicators that there is a problem. There are no symptoms or pain. 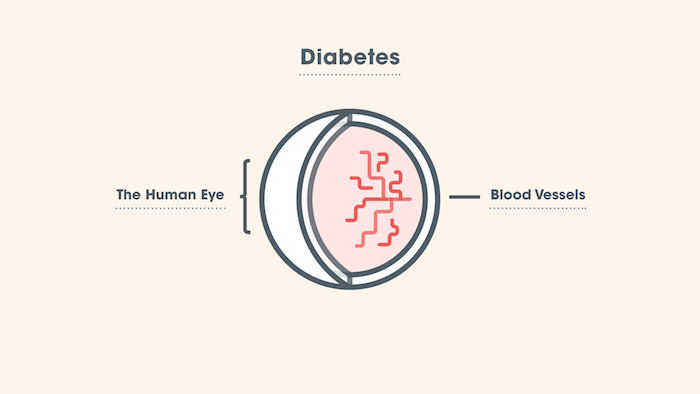 Vision can start to blur as the blood vessels weaken, which is why it is so important for diabetic patients to see their eye doctor regularly. A dilated eye exam (or optomap® exam) can detect diabetic eye disease in the retina before vision loss occurs. The earlier the detection can mean a more positive outcome of treatment. There are several treatments for diabetic retinopathy including laser eye surgery or pharmaceutical injections that prevent fluid leakage that can improve vision. Ways to prevent diabetic eye disease coincide with the managing of diabetes altogether: controlling blood sugar, blood pressure and cholesterol; maintaining a healthy diet and exercise; and having regular eye exams to monitor the disease. If you have diabetes, it is important to schedule yearly exams with your optometrist in order to monitor the health of your retina. Also, make sure to come in if you are noticing a sudden change in vision or floaters, blurred vision that affects only one eye or vision changes that are not associated with a change in blood sugar.